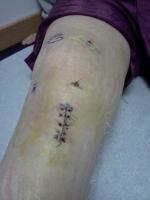 i had patella acl reconstruction in 92. 10 years later the knee became unstable. fell down etc. went to orthopedic, after tests said knee was no longer stable and put me out of work as i am a bridge worker and climb and lift heavy weights. i have put off surgery as i'm not sure i will do that awful rehab again. doc said then i have to wear brace if i don't have the surgery.i am approaching 60 and do not have to work. should i do the surgery or continue wearing brace. i am used to the brace and am scared of having more surgery.